An analysis issued by Columbia Community Mental health reviewed reports from suicides for the period 2016-2018. The review, conducted by CCMH graduate-level intern Megan Weaver, relied on death reports that had been submitted to the Columbia County District Attorney's Office. The report gathered data about the suicides, but more so, about how law enforcement responded. "Officers are tasked to complete death investigations while gathering information from distraught family members and friends," Weaver wrote in the report. Often, the report shows, officers did not do, or document, thorough investigations that would assist in future suicide prevention. Another key finding was that there was a significant increase in drug-related deaths in the county between 2016 and 2018, although these deaths were not grouped with suicide deaths because of the unknown intent. In these drug-related deaths, there was often less "documented effort to gather sufficient mental health history," according to the report. "It appears there is a lack of emotional and/or resource assistance support for friends/family," the report notes. The report recommends that first responders and investigators collaborate with behavioral health providers to provide crisis support for family and friends. The report also advised law enforcement to implement a checklist or template to use in suicide death investigations. Such a "consistent, uniform practice" would create useful data that behavioral health providers could use to design effective suicide-prevention services. Between 2016 and 2018, there were 35 suicide deaths reviewed by the CCMH report. There were 40 suicide deaths in Columbia County in that time frame, according to the Oregon Health Authority, but the CCMH report only reviewed cases with death reports submitted to the DA's Office. Thirty of the deaths, or 85 percent, were men. Firearm use was the most common method of suicide, followed by hanging. 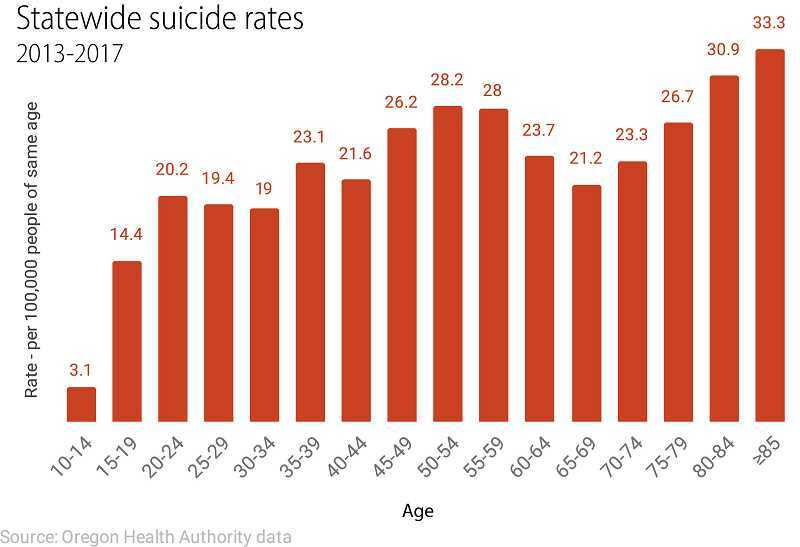 The majority of suicide deaths were among people 50 years and older. According to the OHA, the state suicide rate increases as individuals age, to 33.3 per 100,000 residents among Oregonians 85 years and older. CCMH board member Jan Spika-Kenna was struck by the the ages when she read the report — but she also wasn't surprised. "It's difficult to get older and deal with illness," Spika-Kenna said. Corrected April 15 to properly attribute a statement from the CCMH report. An earlier version of this story incorrectly attributed part of the report to the Columbia County Sheriff's Office.